The Evening Standard has reported that Premier League clubs Liverpool and Manchester United are gearing up for a bidding war to sign Arsenal midfielder Aaron Ramsey in January. The Welsh midfielder's contract is set to expire in May next year, and the midfielder was set to sign a new deal after negotiations with Arsenal. However, it was recently revealed that the North London outfit had taken back their contract offer, reigniting the possibility of him leaving the Emirates on a free transfer next season. In a tweet that has since been deleted, Ramsey's representatives Avid Sports and Entertainment said, "There is nothing we can do, the club made a decision. Life goes on”. Ramsey will be free to negotiate with teams outside of England come January. Since talks between Arsenal and Ramsey broke down last summer, a number of clubs have kept an eye on the Welshman. 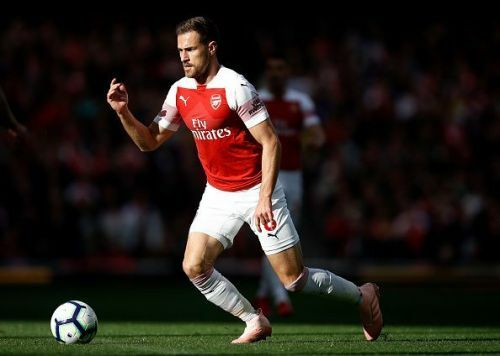 While clubs like AC Milan, Inter Milan and Juventus are closely monitoring the situation, reports suggest Ramsey would rather stay with his family in England. Liverpool and Manchester United are now expected to go head-to-head to sign the former Cardiff City man, with reports stating officials at Arsenal believe that one of the two clubs will take advantage of the contract breakdown. Liverpool boss Jurgen Klopp has been a long-time admirer of the Welshman and is keen on bringing the midfielder to Anfield after talks with Lyon's Nabil Fekir broke down. The Merseyside club is reportedly lining up a £25 million bid for the midfielder this summer. United have also been long term fans of the Arsenal man, having famously declared that they had signed him ahead of Arsenal in 2008 on their website. Arsenal may not be too keen on selling their longest-serving player to their domestic rivals, but could benefit from the funds as new boss Unai Emery continues to rebuild the North London side.